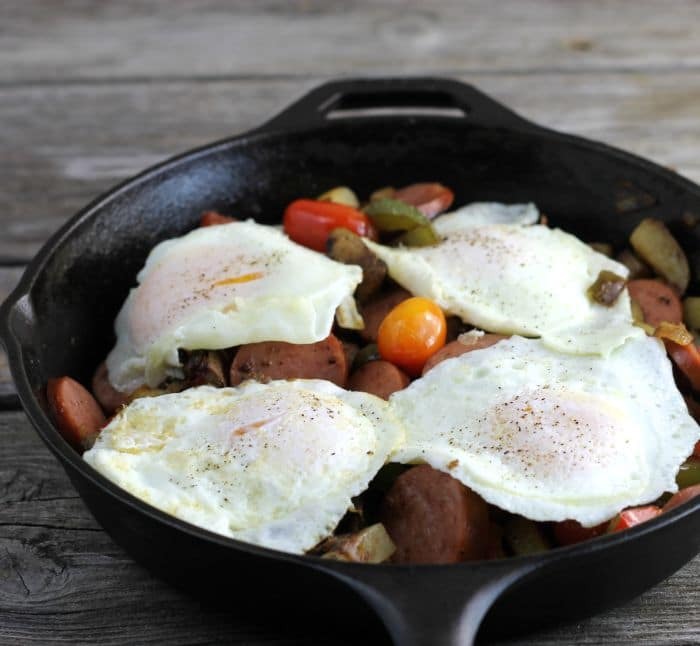 Smoked sausage breakfast skillet isn’t really just for breakfast it also makes a great lunch or dinner. I for one love breakfast foods for dinner, so I have had this one for dinner already. It would not be a surprise to my family when I say that I am a fan of breakfast. Yep, I have said it on my website several times as well. My mom always said that you need something in the morning to get you going and I guess that I have never forgotten her words. I remember when Mike and I first got married we would buy a link of smoked sausage and with the leftovers, we would slice the sausage and fry it up with scrambled eggs. It was always a treat. 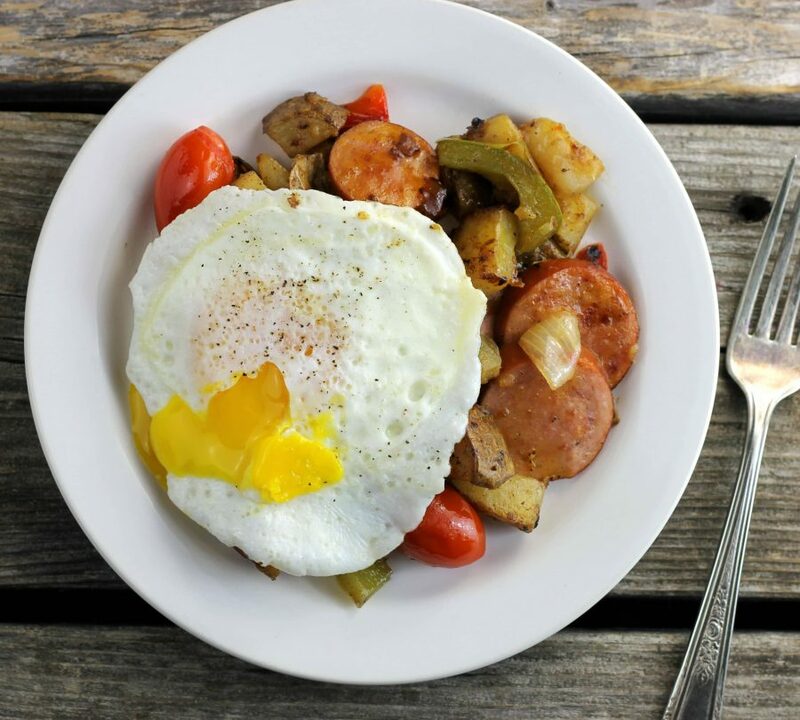 This smoked sausage breakfast skillet is a take off from that sausage and scrambled eggs of years ago. If you have this breakfast or dinner, either way, it is a hearty meal that I am sure you will love. In a skillet melt the butter over medium heat and add the potatoes. Cook eggs for 5 to 10 minutes or until they are starting to soften slightly. 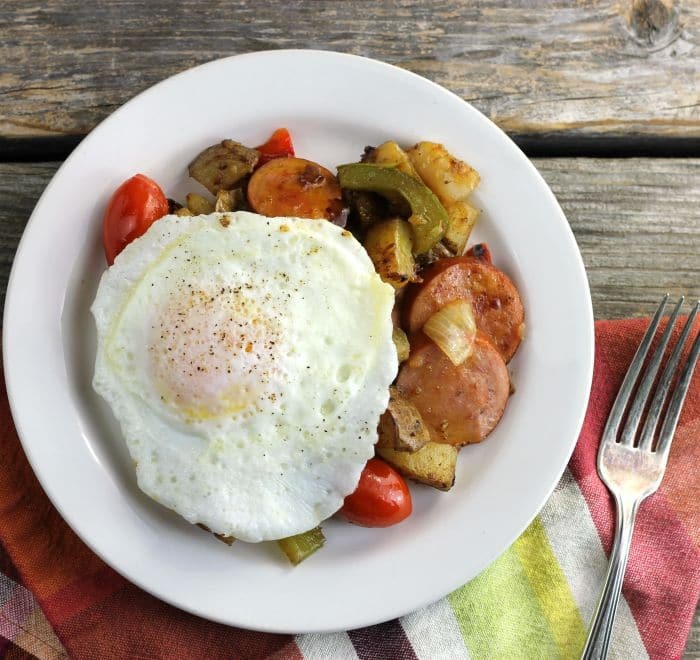 Fry the eggs in another skillet and set on top of the sausage and veggies. I have made the skillet with cooking the eggs with the vegetables, but the vegetables and sausage would start to burn since it takes time for the eggs to cook. I’d definitely eat this ANY time of day—but what a fun breakfast for a special occasion (especially when my sons are joining us—perfect for them!). 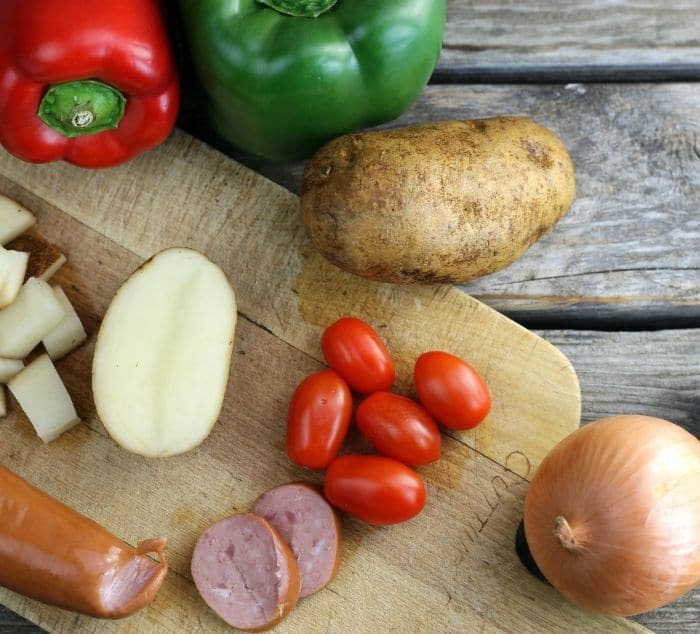 I love making casseroles with smoked sausage! This looks amazing topped with those fried eggs, I will definitely be making your breakfast skillet, Dawn!! That looks absolutely delicious Dawn!! I could eat that for dinner or breakfast anytime! Thanks for stopping by and wishing me a Happy Easter! Same to you!! Breakfast, lunch or dinner…this is a recipe I can totally get behind! I love smoked sausage, and this sounds delicious. I might need to keep this in mind for one of the weekends coming up! 🙂 Hope you had a great Easter, my friend!